FROM: Brachialis arises from the anterior surface of the distal half of the humerus, and to the adjacent intermuscular septa, more so medially. TO: Anterior surface of the coronoid process of the ulna. INNERVATION: Musculocutaneous nerve (C5,6), with a small part of the lateral aspect of the muscle supplied by the radial nerve (C7). ACTION: Brachialis flexes the elbow, with the forearm pronated or supinated. FUNCTIONAL ANATOMY: Often described as the workhorse of the elbow joint, the brachialis muscle is unaffected by forearm rotation because its line of pull remains unchanged regardless of wrist/hand position. 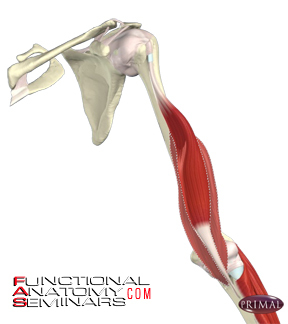 The brachialis is one of the rare muscles of the body with only one movement related contractile function (i.e. elbow flexion); however it also known to act in joint compression across the elbow. Also of note is its dual innervation from both the musculocutaneous nerve, as well as a proprioceptive branch from the radial nerve. As with other muscles intimately situated with an articulation, the muscle contains a great deal of mechanoreceptors and thus, coupled with its innervation pattern, plays a key role in kinesthetic awareness and proprioception concerning the elbow. mechanical advantage because when the arm is fully extended, it is anterior to the axis of rotation and helps to initiate elbow flexion. The tendon of the superficial head of the brachialis muscle inserts distal to the deep head, along the coronoid process, providing its greatest mechanical advantage when the arm is at 90 degrees flexion and thus stabilizing an already flexed arm. Because its fibers are predominantly muscular as it crosses the elbow joint (on 5% being tendinous at this point), the brachial muscle carries a high risk for ectopic ossification if rupture and intramuscular hemorrhage occurs (myositis ossificans). 1. Leonello DT, Galley IJ, Bain GI. Brachialis muscle anatomy. A study in cadavers. J Bone Joint Surg Am. 2007 Jun;89(6):1293-7. 2. Kulig K, Powers CM, Shellock FG, Terk M. The effects of eccentric velocity on activation of elbow flexors: evaluation by magnetic resonance imaging. Med Sci Sports Exerc. 2001 Feb;33(2):196-200. 3. 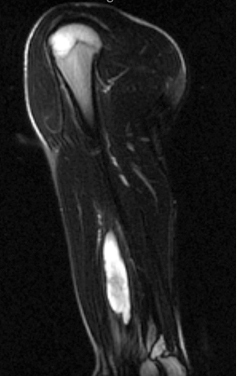 Nishida Y, Tsukushi S, Yamada Y, Hosono K, Ishiguro N. Brachialis muscle tear mimicking an intramuscular tumor: a report of two cases. J Hand Surg [Am]. 2007 Oct;32(8):1237-41.